Investigators: Alicia Sanders, Chris Carter, Dave Schumacher, Deb Skinvik, Derek Arneson, Jennifer Lauer, Tim Buchholz, Troy Hartman, Walt Baker. Equipment Used: (3) Tri-Field Natural EMF Meters, (2) EMF Gauss Meters, (3) Digital video cameras with night vision, (3) Wireless camera video surveillance system, (4) digital cameras, (2) motion detect IP cameras, (2) Portable recorder and cassette players, (3) 35mm cameras, (3) digital audio recorders, (2) laptop computers, Remote IR Thermal Probe Meter, (2) Temperature Gauges, Digital multi-meter 510 with PC interface and EMF adapter, HOBO temperature data logger with software for data logging and archiving, GM-10 radiation detector with pc interface with RAD software to log and archive data, Air-ion Counter. Moon Phase: Waxing Crescent with 1% of moon's disk illuminated. Our group was contacted by the bar manager to investigate a possible haunting at the bar. THE BAR NEXT DOOR The manager claimed that other employees, patrons of the bar, and she had been experiencing strange incidents. Occurrences include a feeling of being followed in stairwells, the sound of footsteps descending the staircase after hours, unexplained noises of loud thuds and rattling glasses, lights turning on and off, unexplained smells of body odor, citrus, and mustiness that last for one hour and then dissipate, shadows of people being seen by customers, ex-employees seeing a man in a fedora and long coat and a woman with long red hair and white dress during closed hours, portraits, bottles, and cigar boxes falling off of walls and secured shelves, doors slamming closed, being poked in the back when alone in a room, chairs found in a different location and position other than when last placed after hours. In the 1930's there was an Irish family from Chicago's Northwest side; Roger "The Terrible" Tuohey, arch foe of Al Capone, his brother Eddie and two sisters. Capone was too powerful for Tuohey so Tuohey opened up roadhouses away from Chicago to distribute his beer. One of these roadhouses was The Wonder Bar. This was the distribution center to supply illegal alcohol for most of Wisconsin. The Wonder Bar became a safe-house for gangsters traveling in and out of the area. A secret tunnel was put in underground for a fast getaway if needed. The building was built bullet-proof with hidden compartments. Purportedly, there is a body buried behind the fireplace in the second floor banquet room. One story claims these are the bones of one of the Touhey brothers killed in a shootout. Another makes them to be that of someone who crossed the Touhey brothers in a business deal. Eddie Tuohey ran the bar while Roger owned and funded it. It was named The Wonder Bar until 1993 when it changed to The Bar Next Door. It's also Madison's first cigar bar. Upon arriving at the bar, Kristin Olshanski, the bar manager, gave us a quick tour. 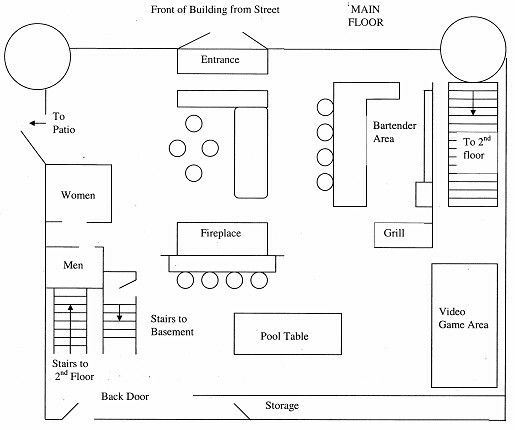 Derek and Troy drew a floor plan of all three floors for reference. View Floor Plans (Basement ) (1st Floor ) (2nd Floor ) Alicia began observing and recording a time line of our activity of what we did and where. We began setting up our equipment on the second floor and basement as patrons still occupied the main floor. 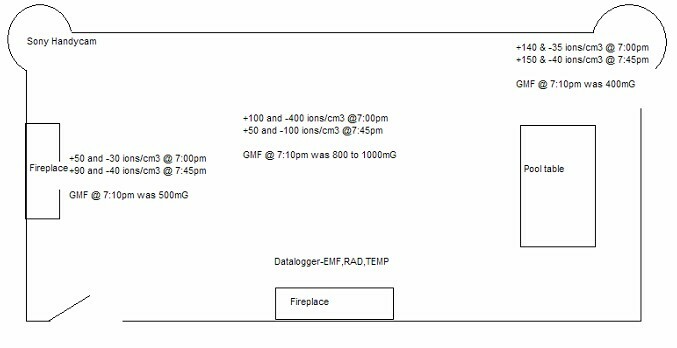 (1) Dave's automated data collection (Datalogger) for EMF, radiation, and temperature was placed on the mantle of the fireplace closest to the back storage room and bathrooms. (2) EMF sweeps, digital pictures, and gauss readings were being performed. Ion counts were being read by Alicia and Dave. (3) Laptop monitoring systems for Dave and Walt were in place. (4) Jen, Troy and Deb were testing theories of slamming doors and moving chairs. (6) Tim, Derek, Troy, Chris, and Dave performed EVP later in the evening. (1) Walt positioned his two motion detection cameras facing two different views for full coverage. (2) Digital Camcorder was placed. (3) Temperature Gauge was placed. (4) Digital pictures were taken. 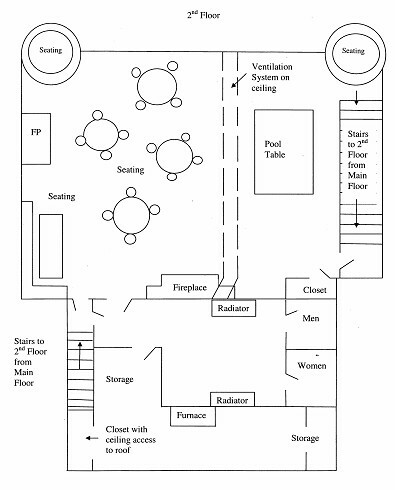 (1) Three wireless surveillance cameras were placed one at the bottom of the stairwell closest to the front of the building facing up to the second floor, one on top of and at one end of the bar, and one near the front of the building facing toward the back end of the bar. (2) Digital pictures were taken. (3) Tri-Field Natural EMF Meter was placed. (4) Interview with Kristin was performed by Deb. Readings on the second floor varied between 400mG 1000mG. Normal non-paranormal Gauss meter readings range between 400-450mG. The negative and positive ion counts also varied on the second floor ranging between -400 to +150. Non-Paranormal ranges have been reported to be between 400 and 450ions/cm3. There were no abnormal temperature readings on any floors. There were no significant differences among any of the time periods. 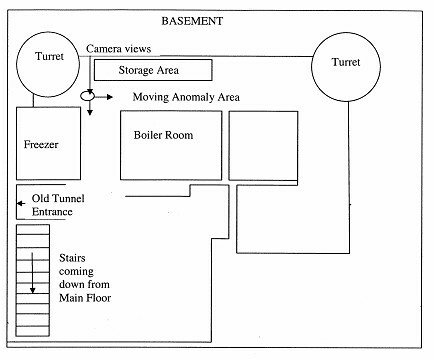 There was an interesting correlation found during the same time frame between a 'spiked' EMF point that Dave had recorded and a moving anomaly recorded in the basement by Walt. DATA RESULTS The moving anomaly appeared on the bottom middle of the screen, angled up and to the left (in front of the kegs on the floor) and then changed direction once again and moved up and turned right heading into the wall on the right. There were no unusual pictures taken with digital or 35mm cameras. An EVP was caught on cassette recorder tape during Deb's interview with Kristin. What is thought to be said is "Grandma" but the level of clarity is such that it is open to interpretation and can be varied. Draw your own conclusions. On December 12th, 2004 I was invited by members of the Southern Wisconsin Paranormal Research Group to participate in a multi-person. The investigation was to be conducted at the Bar Next Door in Madison, WI . No other information was given prior to the investigation in order to prevent any bias during data collection and analysis. Deb Skinvik was in charge of the investigation. Extech MultiPro Digital Multimeter 510 with pc interface. The Extech Electromagnetic Field EMF Adaptor 480824 was used with the multimeter. The probe has a band width of 30Hz to 300Hz and an accuracy of 4%+2mV at 50Hz/60Hz. 1mV DC equals 1mG. HOBO Temperature data logger from Onset Computer Corporation with data logging and archiving ability. 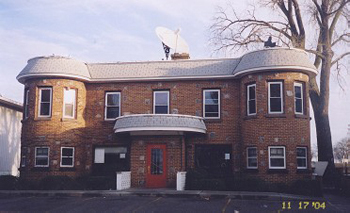 Software provided by Onset Computer Corporation was used for data logging and archiving. GM-10 radiation detector from Black Cat Systems with pc interface. The Radiation Acquisition and Display (RAD) Software was used to log and archive the data. Radiation detected includes alpha, beta, and gamma/x-ray. Data is displayed as counts per minute (cpm). Hall Effect Gaussmeter from Integrity Design and Research Corporation. A bare probe was used with the gaussmeter. The bandwidth of the bare probe is 68Hz at 3dB. TriField Natural EM Meter. Readings were taken with the sum setting. Sper Scientific Electromagnetic Field Test 840025 EMF meter. Band width is 30 to 400Hz with 4% accuracy at 50Hz/60Hz. Data is displayed as mG.
Air ion Counter. Positive and negative ion counts are displayed as ions/cm3. Sony Digital Handycam DCR-TRV19 NTSC with night shot. Olympus Camedia Digital Camera C-4000 zoom. 4.0 mega pixel. GE Personal Portable Recorder and Cassette Player 3-5027. Panasonic Toughbook CF-45 laptop computer. All sound data was digitized and processed using Acid Music 3.0 and Audio Cleaning Lab 3.0. All equipment was calibrated and tested prior to use according to manufacture specifications. Automated data collection for EMF, radiation, and temperature were done on the second floor. The Extech MultiPro Digital Multimeter 510 with EMF adaptor, HOBO temperature data logger, and GM-10 radiation detector were connected to the Panasonic Toughbook CF-45 laptop computer. EMF measurements began at 6:14:31pm and stopped at 9:11:15pm. 3,176 data points were collected. Radiation measurements began at 6:12:37pm and stopped at 9:11:43pm. A reading was recorded every 1 minute. Approximately 178 data points were collected. Temperature measurements began at 6:09:53pm and stopped at 9:14:17pm. A reading was recorded every 2 seconds. Approximately 5533 data points were collected. The second floor and automated set were monitored with the Sony Handycam using the night shot feature. All collected data was exported to Microsoft Excel for analysis and graphing. Air ion counts and gaussmeter readings were obtained at various locations throughout the second floor. The gauss meter readings varied throughout the second floor from a low of 400mG to a high of 1000mG. The 1000mG reading in the center of the room in notable since Gauss meter readings of 400 to 450mG are normal and have been recorded in various locations where there are no reported paranormal events. The negative and positive ion counts also varied throughout the second as seen in the above figure. During the data collection process, the positive ion count went from 50 ions/cm3 to 150 ions/cm3. The ion counts in the center of the room dropped to about ½ their value from 7:00pm to 7:45pm. Positive ions have been found to be associated with increased irritability and negative moods while negative ions have the opposite effects (Charry &Hawkinshire, 1981). Ions counts taken at location where there have been no reported paranormal events range between 400 and 450 ions/cm3 for both positive and negative ions. The graph below shows the temperature readings from 6:09:53pm to 9:14:17pm. 5533 data points were collected. No abnormal ambient temperature readings are seen. The graphs below show the EMF and radiation data. 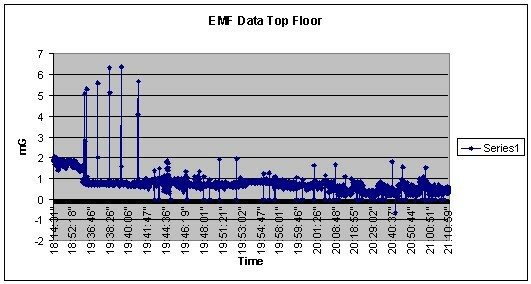 EMF data collection began at 6:14:31pm and ended at 9:11:15pm with 3176 data points collected. Radiation data collection began at 6:12:37pm and ended at 9:11:43pm with 178 data points collected. The table below highlights the notable characteristics of the EMF data. The decrease in 'background' and the first spike seen around 7:12pm correlate with a moving anomaly that was recorded in the basement by investigator Walt Baker. Still frames of the video sequence are shown below.